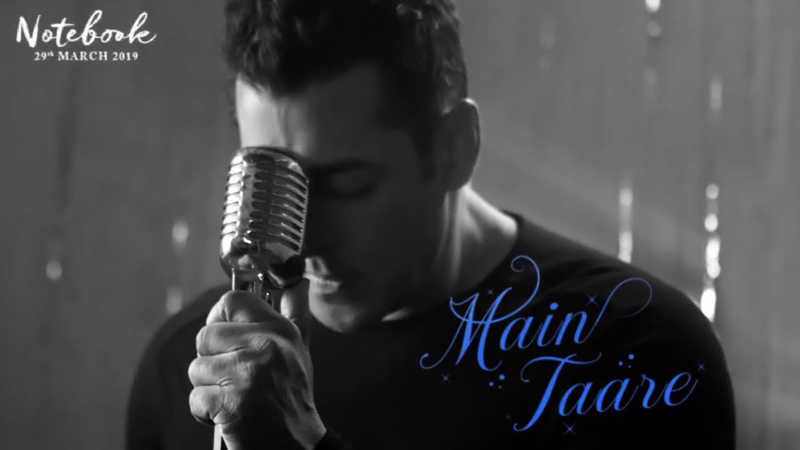 Salman Khan has a few songs to his credit and now one more song has been added to that list and it is brilliant. The superstar has lent his voice for a song titled Main Taare from his upcoming production, Notebook. The film will see the launch of two new actors in Bollywood – Pranutan Bahl and Zaheer Iqbal. While Zaheer is Salman’s friend’s son, Pranutan is the granddaughter of late actor Nutan and the daughter of actor Mohnish Bahl. Written by Manoj Muntashir, Main Taare has been composed by Vishal Mishra. When brainstorming for a singer to sing the romantic song Main Taare for the film, the Notebook team thought that Salman Khan would be the perfect fit and we have to say they were right! Set to release on March 29th, the Salman Khan produced Notebook was directed by Nitin Kakkar. It tells the story of an ex-army officer Kabir (Zaheer Iqbal) who comes back to Kashmir to be a school teacher. The school is situated in the middle of the remote Wuller lake, lacking basic amenities like running water and electricity and attended by just a handful of students. This wasn’t quite what Kabir imagined when he signed up to teach. At the school, one day, Kabir finds a notebook, left behind by the previous year’s teacher Firdaus (Pranutan Bahl) and that changes his entire life. Happy, spirited and heartwarming, Notebook is about two people finding love in the most unexpected way. 15 queries in 0.369 seconds.